Translated from the German original by Brigitte Hamilton. Anyone investing in the development of Free Software (Open Source) usually wants to achieve a long-lasting effect despite a limited budget. In addition, the promotion of open and independent further development is also an objective. Using the encryption solution "Gpg4win", measures that can achieve this goal will be discussed. Starting point of the study is the analysis of to-date initiatives that are comparable to the Windows version of GnuPG software. A motivation and qualification process should be established for allocating and placing the necessary competencies. The promotion of commercial stakeholders is an ideal complement to this process. The long-term objective is the financing of a professional management for a portion of the required activities. The path leading to this objective must be made possible and also well communicated. How this could work for Gpg4win will be shown below. The technical progress achieved with Gpg4win's forms a basis for these measures. A slow withdrawal from an investment would be ideal, so that at each time other participants could take over. This short study was put together parallel to the product "Gpg4win"1. Gpg4win is an installation package for Microsoft Windows which contains numerous help programs and extensive German documentation besides the actual encryption application "GnuPG". The objective of this project is to improve the usability of the encryption software GnuPG and to therefore facilitate the use and operation of cryptography for laymen computer users. For this purpose, in addition to the simple installation of the software, the integration of the command line tool GnuPG into graphics user interfaces such as "Outlook 2003" and "Sylpheed Claws" is also promoted. In this way Gpg4win intends to replace the outdated GnuPP2, which has not been updated for a while. It is hoped that such a standstill situation can be avoided for Gpg4win. The objective of this short study is to discuss the corresponding measures. Version 1.0 of Gpg4win has updated the software. This short study suggests a strategy of how a self-sustaining project can develop. The goal is to facilitate a more sustained further development of Gpg4win. Starting point for the short study are the general success factors for Free Software projects, as well as the problems regarding an sustainable further development of GnuPP, Windows Privacy Tools 3 and comparable approaches. While this study is concerned with Gpg4win, more general conclusions may also be drawn, especially for products which are the result of a bigger project and are targeted towards Microsoft Windows as the basic operating system. In the end, this study intends to highlight the issues. even though there are a number of additional aspects that are also worthy of examination but could not be mentioned or discussed. As a result this short study is meant as a starting point and motivating factor for thinking about the kind of questions which need to be asked regarding the sustained existence of Free Software products. Investigation of publicly available information of comparable projects, establishing contacts where possible. Compilation of success factors for Free Software projects. Analysis and comparison of Gpg4win and other comparable projects using the authors' experiences and success factors. A search of the literature regarding the main content areas "Free Software in Windows", "Security Software" or "Structure and sustainability as a result of a commercial development project" did not yield any helpful results, whether in English or German. The literature is mainly limited to technological success factors for Free Software initiatives and the development of individual business models on the basis of Free Software products. Also included in this study are the many years of experience by the authors with Free Software, a topic with which they have dealt with exclusively and professionally since 1999. The authors have carried out a number of different projects for e-mail encryption with GnuPG since 2000. What is a "Free Software Project"? Free Software is software which is accompanied with a permanent authorisation that it can be used by anyone for any purpose. The distribution, improvement and copying of improvements of the software is also allowed. Here Free Software is used analogous to the term used by the Free Software Foundation Europe (FSFE). Other terms for Free Software are "Open Source" or "Libre Software". In its original connotation, a project is a one-time undertaking. This meaning has changed somewhat for Free Software, as it no longer signifies just a one-time undertaking, but usually a sustained activity around a software, whereby the latter is created and further developed and maintained for an indefinite period of time. Besides the actual software, documentation, infrastructure, availability of information and participants also form a part of this activity. Research and education facilities for testing and demonstration purposes. See (Lakhani et al. 2002)4 and (Reiter 2004) in German5. Which tasks must be assumed on a regular basis? Who carries out these tasks? Someone interested in Free Software can participate in two ways: contributing time/labour or money. The amount can be freely chosen. At the same time, tasks can only be carried out with labour, while contributed funds must be converted into labour. This brings up the question regarding qualification and business model. A successful Free Software project is characterised by a balanced cooperation of participants, as shown in Figure 1. As a rule, adjacent layers communicate actively with each other, for example, contributors with power users and developers. 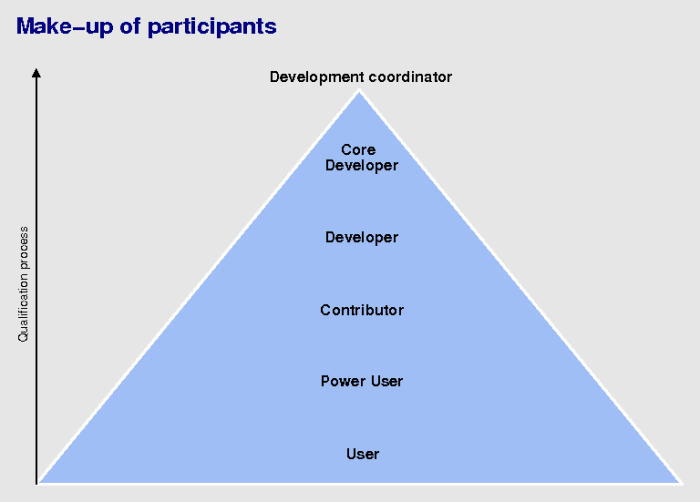 Figure 1: Participant make-up of a successful Free Software project: The pyramid structure is composed of a broad basis of users, out of which power users, contributors, developers and core developers lead towards the development coordinator. Normal users of the software. They obtain information and advice from the documentation and from other, usually active, users. A user with more extensive technical know-how and knowledge, who uses the software more intensively than a normal user and assists others with operating the software. Usually power users are registered on the respective mailing lists or forums and will also answer questions from other users. A contributor makes a regular and active contribution to the respective Free Software project, however not usually with regards to source codes, but rather by assuming other activities such as writing documentation, testing experimental versions or formulation of requests. Participants who in conjunction with others or independently carry out regular improvements to the software's source code. These improvements often include bug fixing or other small functional upgrades. Participating developers who possess good knowledge of the software's architecture and are actively involved in its further development. The individual in the circle of core developers who has the final word on decisions regarding architecture, the inclusion of new functions or similar items. This is not usually a position involving authoritative characteristics, but rather concerns the tasks of moderating discussions regarding architecture and functionalities. Issues regarding the rights, duties, election and replacement of the coordinator are handled differently in many Free Software projects. In the very rare event of a dissent that cannot be resolved, the Free Software project is split into two projects. The qualification and integration processes are very important for Free Software activities. If a project is able to turn users into power users, and power users into contributors etc., the result is an additional motivation as well as support for the original core developers. They are then able to push forward the product per se and thus concentrate on work that directly benefits users. Because of the type of structures that developed it is very difficult to directly recruit a core developer or developer. An individual must grow into this leadership position. For this reason, a large number of users is an important factor as it forms the basis for the integration. There are conventional ways of increasing the number of users and popularise the respective Free Software activities - in the case of Free Software, attaining new users is achieved mainly through globalisation, entry into different software indices and through personal contact on mailing lists and meetings. The transition from the first management group to the second is a critical item for each Free Software activity. Many times it is a very specific person who started and instilled life into the project. At some point this person loses interest in the software or is no longer able to continue working on it and must transfer responsibility for the project. At this point it becomes very evident whether there is enough critical mass to form a new management group. A positive aspect is if the work was already previously divided among several individuals. Hence, the broader the pyramid in Figure 1, the better. In order to participate in the qualification process, participants must be motivated to do so. In the case of volunteers it is clear that a certain level of enthusiasm or fun is helpful. Freedom of being able to modify the program. A good infrastructure can be helpful for bundling communication requirements. This includes an appropriate amount of mailing lists, forums, websites, ticket systems for bug lists and requests, and an open version monitoring system. Both infrastructure and software/documentation must make it relatively easy for interested individuals to participate. Unnecessary difficulties should be avoided, this applies both to technical, language and organisational aspects. The following two examples describe successful Free Software projects, the reasons for their success and how they differ from Gpg4win. With over 60% market share6, the web server "Apache" has been a worldwide leading product for years. Apache was Free Software from the beginning and was further developed and improved by responsible system administrators one step at a time. Almost all work done on Apache was the result of concrete technical and in part urgently required requirements. These requirements originated mainly from a series of businesses which use the web server intensively. The large number of users and developers led to the creation of the Apache Software Foundation7 (ASF). It now supports and coordinates over 30 individual projects in the area of web-based services. In total there are over 1,000 active developers registered with ASF. Certainly, decisive success factors include the existence of actual technical requirements and the fact that the users, hence also the administrators, are highly qualified on a technical level. Many users are capable of carrying out their own analysis and fixing of errors. Furthermore users and developers are able to use Apache on the software/hardware system they are familiar with, which is an additional motivating factor. In contract, Gpg4win users usually have less technical qualifications. Obviously, one reason for this is that Gpg4win is a program for end users rather than a server application which is geared towards administrators. Furthermore, Gpg4win automatically specifies the operating system. Gpg4win does not present a real challenge to programmers, since as a meta project it is not directed towards actual programming. Results obtained from other projects (e.g. GnuPG) are also taken in. Samba is a Free Software implementation of data and print services for SMB/CIFS clients. SMB and CIFS are proprietary protocols of Microsoft. A Samba installation can seamlessly replace both a respective Windows client or Windows server for data and printing services, i.e. without the other systems in the network knowing or even being aware of its presence. At the same time it represents a bridge to data and printing services under GNU/Linux. In many companies Samba has replaced data servers by Microsoft or Novell. It is used anywhere where mixed environments consisting of GNU/Linux and Windows work places exist, and in part even in pure Windows environments. The decisive success factor for Samba is the very real interest of many companies in utilising this solution. In addition, in its role as data server it also presents a critical application for almost all companies. which also means that budgets for this purpose will exist, which explains why there are now a number of companies which offer services for Samba. Some of these companies will also have employees who focus on the improvement and further development of Samba. In contrast to the Apache project there are significantly fewer administrators who are technically qualified to independently carry out improvements to Samba. In contrast to a data server, the encryption of e-mails is not considered a critical application for most companies. For this reason there are smaller budgets for maintenance and support contracts. In the case of Gpg4win it is more difficult for a commercial market to develop as easily and quickly as for Samba, because the latter was more suited for commercialisation due to its key significance for companies. An examination of approaches developed to date includes a historical perspective and in particular takes into account possible causes why a sustained independent solution through other projects could not be established to date. At the end of 1999 the Federal Ministry for Economy and Technology began a promotional project with the objective of porting GnuPG to Windows, developing graphic user interfaces and preparing good quality German documentation. The name of the project was "Free Software and IT Security". The major participants were G-N-U GmbH (development), Werner Koch Software-Systeme (replaced by OpenIT GmbH, development) and Linuxland International (marketing). Project manager was GUUG e.V. Intevation GmbH (project management and development) joined during the end phase of the project. One individual took over the project management function for the first number of months but left early on without being replaced. The project was finished successfully in 2000 and was subsequently presented at exhibitions. Also developed as part of the project were the graphics key manager Gnu Privacy Assistant (GPA), a revised GnuPG, the German web pages www.gnupg.de, the Gnu Privacy handbook in German and English, the crypto-programming library GpgME, several feasibility analyses on the integration into different e-mail programs, and integration into the e-mail program Sylpheed. Other items worthy of mention include the development of WinPT (support for the operation of the Windows clipboard for encryption purposes) and the Gdata Outlook plug-in for the use of GnuPG in the e-mail program Outlook. Both products were independently contributed by third parties and are therefore to be considered as a collateral benefit. As part of subsequent financial support the project is renamed "GnuPP" (Gnu Privacy Project). GnuPP lasted from May 2001 to March 2002. The main objective and result of this project are an updated installation packet (GnuPP 1.1) as well as extensive illustrated handbooks, which were also published in brochure form at considerable print volumes (CD with brochure "GnuPP for Novices"). In addition, a project home page under www.gnupp.de was also created (although significantly reduced since that time), as were a user forum in the form of a mailing list and an automatic system (e-mail correspondence robot "Adele") for testing purposes. The latter is used in line with the tutorial in "GnuPP for Novices". As far as is known, only G-N-U GmbH was commissioned and participated. Brochures and illustrations were prepared by outside service providers. The web page, mailing list and correspondence robot "Adele" are still active. The installation packet GnuPP 1.1 is no longer offered as a download, whereas "Novices" and "Experts" are still available (as PDF documents). The installation packet GnuPP can still be downloaded from different websites. Initial user acceptance and attention for GnuPP can be characterised as considerable. The mailing list shows the following volumes: 2002: 881 e-mails, 2003: 877, 2004: 671, 2005: approx. 200. Almost 500 individuals were active participants, while the number of registered persons is not known. The CD and brochure were published in a first edition in March 2002. The volume of the print run is not known, but is likely not less than 5,000 copies. A second edition was considered but subsequently abandoned. The reasons for this are not known. Both GPA as well as GnuPP are not official projects under the GNU projects8, although the name would suggest as much. Only GnuPG itself is an official GNU project. It is thought that the lack of additional financial support caused G-N-U GmbH to stop offering active support at the end of 2002, although the company continues to operate the website and automated processes (user forum and "Adele"). There were increasing incidents of problem reports on the mailing lists, and while they were partially corrected in the components themselves (e.g. GnuPG by the GnuPG developer team), no updated installation packets were made available. Neither the source code for the installer nor instructions for the assembly of an installer were provided on a general basis. However, it stands to reason that the sources were made available on explicit requests. Still, it must be mentioned that in the end an update of GnuPP by third parties never took place. Within the context of GnuPP there are no visible activities that are designed to interest and enable those with technical knowledge in order to entrust them with the updating of the installer or web page. It must be concluded then that this was not a declared objective of the project. In the meantime the GnuPP 1.1 installation packet has become hopelessly out of date with regard to the integrated components. The project Windows Privacy Tools9 (somewhat confusingly, its acronym WinPT is the same as the integrated software Windows Privacy Tray10, hence the former will subsequently be abbreviated as P-WinPT) was registered on the software development platform Sourceforge in January 2003, therefore at a time at which GnuPP no longer demonstrated any further development. The driving force behind this effort was an individual from Canada. Objectives and requirements corresponded roughly with the GnuPP project, however with an additional focus on good multilingual support, i.e. globalisation. An English-language handbook was also prepared. The most recent version (2003) of the handbook has approx. 40 pages and describes the installation and operation of WinPT, GnuPG and several plug-ins for e-mail programs. In principle, the only developer activity worthy of mention took place in 2003. The last publication of P-WinPT is version 1.0rc2 from 27 April 2003. In May 2005 Fabian Rodriguez opened the position of project manager, since he had not been active for some time. However, it appears that no one indicated any interest in assuming this position. Despite its short activity phase, the project appears to be very popular. Download volumes are quite impressive and are probably above those for GnuPP: P-WinPT 1.0rc2: more than 270,000, P-WinPT Handbook 02rc2: more than 42,000. The reason for the large numbers is probably the fact that the project was able to speak to an international audience. There are approx. 1,000 individuals signed up on the announcements mailing list. There is no English mailing list per se, the mailing lists for the different languages (there is no German one) do not show any noticeable activity. Entries regarding problems, requests and queries continued to be made far beyond the active phase. Including a number of them as late as 2006. They were not processed. The activity of the project was closely tied to the activities by its initiator. When Fabian Rodriguez was no longer active, no new versions were published. One large problem was probably the fact that there was no English discussion list which would have allowed interest parties to coordinate their efforts. The fact that the links list did not make reference to either GnuPP or any other similar approaches can also be considered a weakness. It is only when one is aware of alternatives that comparisons can be made. The continued number of new entries in the Bug Tracker may also be a result of this being the only visible avenue for users to address problems associated with P-WinPT. The P-WinPT project finally attempted to integrate the software WinPT into itself. No links are found on the WinPT home page, where new versions were announced until August 2004 and downloads were also provided. Without carrying out additional research a user would not know that the software WinPT is an independent project which in the meantime has been extensively improved. As a result, this attempt can be seen as a tactical error. The project Gnu Privacy Tools (GnuPT11) was initiated by one person from Germany, probably around January 2004. According to statements by the initiator, new versions of Windows installation packet GnuPT have been published approximately every 2 to 3 weeks since May 2004. The web portal to GnuPT is organised as a pure forum platform. According to the author the further development of GnuPT will soon cease in favour of Gpg4win. Based on the statistics of the forum software one can assume that there are less than 50 active participants and less than 3,000 readers. In general, it appears that all questions are answered on the forum, hence the support is considered as good. The number of downloads cannot be determined. The forum structure is unwieldy since the entire project organisation is carried out through this forum. There is no separate bug tracking system, no mailing lists and no history for installation packets (only the most recent version may be downloaded). The project seems to be mainly operated in Germany and is not an official GNU project. Furthermore there is no source code for the installer, hence only the project manager can create a new version. As a result the installer itself is not considered Free Software. Overall there is a danger that it would be difficult for someone else to continue the project should the project manager lose interest or is prevented from continuing his work (e.g. through an accident). The installation packet GnuPG Pack-Basics12 has been maintained by a single individual in Germany since approximately 2003. Little is known as to its history, since there are no mailing lists, forums or similar which would enable the formulation of some conclusions. The author is not averse to coordinating or working with Gpg4win, but in the meantime GnuPG Pack Basics will continue to exist. Not much is known as to how many users have this installation packet. From time to time users appear on the mailing lists of GnuPP or GnuPT. Similar to GnuPT there is a risk that it would be difficult for someone to continue the project if the project manager loses interest or is prevented from continuing his work (e.g. through an accident). Furthermore, user guidance, documentation and discussion forums are only in German. GnuPT is not an official GNU project. In addition, there is no project-specific infrastructure in which users and potential developers could exchange ideas.The source code of the installation packet is also not made available. As a result the installer itself is not considered Free Software. Hence the project manager is the only person who can easily compile updates. At the time of writing, the current version of Gpg4win was 1.0.2 (2006-05-30). Updates of software components GnuPG, WinPT and GPA. In particular, the current versions of GPA (0.7) were again made suitable for use in Windows. After version 0.5 (included in GnuPP 1.1), GPA was only being tested on GNU/Linux. Integration of new modules: GPGol (Outlook Plugin), GPGee (Explorer Plugin) and Sylpheed Claws (complete e-mail program including plug-in for GnuPG). Particularly Sylpheed Claws was again made suitable for use with Windows. GPGol was also significantly expanded and improved. Updates and extensions to handbooks "Novices" and "Experts". Both handbooks are available as both PDF as well as on-line versions. New installer technology (NSIS) with extensive automation. The mechanism for the assembly of installation packets is now transparent, documented and completely Free Software. The packet must be “cross”-built on a GNU/Linux system. This has advantages regarding the automation and integration of programs with GNU/Linux origins (GnuPG, GPA, Sylpheed Claws), but also has the disadvantage that a pure Windows developer cannot easily create an installation packet by himself. A new home page summarises the most important information for Gpg4win. It is also completely bilingual (English and German). A technical infrastructure with the usual standard services is available to the community of users and developers. It includes bug tracker for error messages, mailing lists for discussions for each users and developers, web forums for different discussion topics, as well as a source code administration system for developers. All this is implemented on the basis of a GForge platform which also allows interested users and contributors both written or administrative access to the individual components of the technical infrastructure. All of these structures are already heavily used by users. The current participant structure for Gpg4win, GnuPP, GnuPT and GnuPG Basics does not correspond with the form that is needed for a successful Free Software project (see Figure 1, pg. 6). 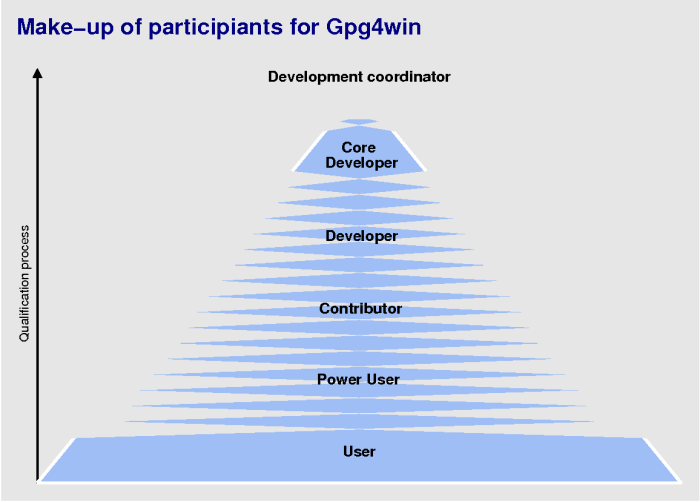 Figure 2: Current make-up of participants for Gpg4win: While there is a broad basis of users, there are no levels of power users, contributors and developers. There is a team of core developers, which in turn does not have an appointed development coordinator. The current Gpg4win participant structure is missing the groups of power users to developers, as illustrated by . In addition, there is no project coordinator in charge when the commissioned project for the development of Gpg4win has ended. In comparison, GnuPP and WinPT are also missing its core developers, since development has been suspended. For GnuPT and GnuPG Basics the individual carrying out the coordinator function is identical with the levels for core developer and developer, hence a very thin layer. Added to that is that software development for Microsoft Windows is technically more demanding since most components are proprietary, unlike Free Software where they can be easily analysed and corrected where required. Within the framework of Gpg4win, GPGol (Outlook plug-in) is a good example for this situation – because of insufficient documentation and programming errors in Outlook a large part of time for labour was expended into so-called reverse engineering and the preparation of so-called workarounds, instead of designing functionality. Another difference is the availability of development tools - developers under Windows often have a proprietary tool kit which is also an obstacle if another developer wants to continue work at a certain spot. In the meantime, the resulting problem has moved Microsoft to remove some of the development tools from commercial distribution. However, despite their free availability the tools remain proprietary and are thus not available in the source code, among others. Since Gpg4win is security software, which in part requires knowledge of fairly sophisticated concepts, the circle of potential contributors is therefore limited. Alone the writing of good documentation material usually requires in-depth security knowledge. Also, in order to ensure consistent trust in the software, a corresponding quality management process is meaningful. This is not usually a fun task for most volunteers. Finally, one difference between GNU/Linux and Windows is that GNU/Linux distributions (Debian, SUSE, Fedora, etc.) integrate useful and good-quality products as fixed components. This is not the case for Windows, where products must be separately installed. Hence, while practically every GNU/Linux system comes pre-installed with GnuPG, software such as Gpg4win must be separately installed on each Windows computer. Gpg4win is a meta project. In this way it is different from many other projects which are each dedicated to a specific software implementation. Gpg4win integrated different products from other projects. The main result is an installation packet for Windows operating systems which is made available as a download. Besides the automated routine for the creation of installation packets, the handbooks "Gpg4win for Novices" and "Gpg4win for Experts" are also considered 'real', proper parts of the project. This requires certain technical knowledge. Training can be further facilitated with a good tutorial, which should consist of examples which illustrate what has been done to update one or other components. It should also take into account some 'extreme cases', e.g. modification of paths and environmental variables. Another component of this task area is the processing of received error reports which are relevant to Gpg4win Installer. This may also include the addition of smaller new features. Through the update of the installer or individual components, dialogues and processes may also change. They must be worked into the handbooks. Communication includes the maintenance of the website as well as announcements for significant updates. Public relations activities include advertising measures for attracting new users and additional contributors. User support includes responding on forums and mailing lists and, in the case of error reports, making assessments of whether they are relevant to Gpg4win or one of the components. In the latter case the error report must be entered in the respective project. The main task here is the servicing of the technical infrastructure. Typical tasks include moderating e-mails that have been 'stuck' in the mailing lists and more general administrative duties connected with the development platform "Gforge" used by Gpg4win. The task of coordinating and directing the entire project is done jointly by the active parties in these five areas. Added to that would be any extra efforts/costs required as a result of fundamental changes to the target platform or the distributed software products. The following estimates are the result of basic considerations and experience related to the development of Gpg4win up to version 1.0.2. 1. Updating of the installer: approx. 12 hours per month. This number is based on the following scenario - a single update usually takes 4 hours plus 2 hour testing. In general, it is expected that there is one update every two weeks. 2. Updating of handbooks: irregular, as required. In principle, changes to the handbooks would be fairly rare and only be done if significant changes to the components have been made or new components are introduced. One can assume that an additional 2 to 3 additional components will be incorporated in the near future. Fundamental changes to existing components are not conceivable at this time. Smaller changes to the installer itself can be expected in the near future and should be taken into account accordingly for the novice handbook. 3. Communications: approx. 8 hours per month, on average. 4. User support: approx. 8 hours per month, on average. 5. Technical administration: approx. 2 hours per month, on average. The efforts required for the different tasks will increase in line with a growing user community. Gpg4win users can be roughly divided into three groups: Agencies/organisations, businesses and private individuals. This base can provide a pool of potential participants or a source of financing. Private users as well as individual users from companies and agencies will form the largest group, at least in the first years. To date, this group is also the largest player in GnuPP and GnuPT. For the systematic use of Gpg4win in companies and agencies only those versions for which standardised support services can be purchased are of interest. Where applicable, there may also be stronger interest in the direction of an installer which supports certain methods for software distribution. Often it is the commercial interest in a Free Software that is the key to sustained further development. However, short-term economic individual interests should not become the main influencing factor, as this type of commercialisation would be damaging. Above all, the four freedoms, more precisely the licensing as Free Software, must be preserved. This still leaves room for profit and occupation - in fact, both of these are desirable. A level of professionalism has advantages, especially for the required tedious tasks and consistent quality. Usually this can only be achieved with a balanced participant structure, not the other way around. The objective of commercial stakeholders is a more sustained linking of main developers to the project, as developers may be able to earn a part of their income by undertaking activities for the project. They are not subject to other obligations which could potentially interrupt or end participation fairly quickly. This point is particularly important in the case of Gpg4win, since the described difficulties (compare section 7.1) likely lead to a smaller number of volunteers than is the case for other Free Software products. It is recommended that a commercial stakeholder model is pursued for Gpg4win. There are different forms of support services which represent a meaningful business model. Anyone working with Gpg4win who is in part dependent on the flawless functioning of the software, has a strong interest in maintaining the continuity and quality of the software, as well as in having available contact persons with in-depth technical knowledge and quick response times. At the same time, a self-sustaining business is only created in steps. Gpg4win already possesses a considerable number of users and has therefore achieved a certain level of visibility. This creates the basis for contacting sponsors/stakeholders from within the user community. Where required, these sponsors may also be requested to provide band width, financing or attend exhibitions or meetings. It is also important to establish the value of the software for the users on a more general level, because it has a direct relationship to the willingness to pay. Many Free Software projects already enable small payments, called 'donations'. This presents a large long-term potential13. A dialogue with sponsors and the number of donations provides valuable clues as to what has been solved particularly well in Gpg4win or where this is still room for improvement. The suggestions are valuable because there is a difference between the comment "I would like to see function X in Gpg4win expanded" and a donation of 100 Euro with the comment "I found function Y very helpful, it would be nice if it could be expanded". The first could be a quick off-the-cuff comment, whereas the latter is generally well thought out. What to do with the money? Smaller amounts, hence amounts under EUR 10,000 annually, should be used to bring in additional individuals. This means qualifying and motivating existing users or power users (public relations work and marketing, compare section 7.6). A direct, commissioned payment for development services will likely only be meaningful with larger amounts. In this case, measures for safeguarding a sustained further development should have priority. Furthermore the commissioning of further development of the basis components are also considered significant, as Gpg4win continues to be a meta project and to a certain extent represents the interface between Windows users and the actual software projects, hence the dissemination of information to users is not only fair on principle alone. It is also meaningful for the success of Gpg4win, because this meta project also benefits from the explicit goodwill of developers of the software module which forms its basis. Next steps may include the establishment of business models by the respective companies, such as those for maintenance, support services, training or continuing development. The safeguarding of the basic continuity may be provided by just one company which expresses sufficient interest, whether for utility or marketing value. Of course continuity would also be at risk in the case of withdrawal by this one supporter. Hence a further objective should be to find more than one supporter, and to ensure that these supporters are not dependent on the same source (e.g. a certain customer). 7.6 What can a one-time monetary contribution achieve? This section summarises ideas which promote the objective of a sustained independent further development, if a one-time monetary amount was available. Creation of an incentive program for the motivation and qualification of users into power users, from power users to contributors etc. A financial incentive system does not seem feasible or meaningful in this context. It will likely work better on the basis of individual recognition. One idea is the distribution, assignment or loan of items that at the same represent a sense or recognition of belonging. In the area of Free Software projects this typically includes things such as T-shirts, coffee mugs or lapel pins. Bronze pin: recognition of extensive support by the user in forums or valuable error reports (i.e. for power users). Silver pin: recognition of work for web page maintenance, testing of error reports or work regarding external communications (i.e. contributors). Gold pin: recognition of the work in actively fixing bugs, preparation of updated Gpg4win installers or the integration of a new module (i.e. developers). Platinum pin: recognition for the core development on the actual components (i.e. core developers). Blue pin: recognition for assuming the role of project coordinator as of a certain number of months. Green pin: recognition for financial sponsorship as of a certain amount. The awarding of pins would be accompanied with a "Hall of Fame" which lists and thus honours the recipients of the respective pins. The goal of automation is to allow someone to focus on the interesting items instead of having to manage or understand tedious material. Possible further automation for Gpg4win can be found in the area of installer assembly, preparation of innovations and announcements, plausibility testing, testing for more recent versions for module integrated in Gpg4win or the publication procedure. The first step prior to any automation is the comprehensive documentation of the respective processes. Good documentation of the different tasks, backgrounds and contexts will do more than facilitate the qualification process. It can also support the motivation process, since the documentation of tasks clarifies early on whether someone feels up to the task. Many times this is also about showing that tasks are significantly easier than one might think. Meetings in person increase the chances of forming a harmonised group and achieving its qualification. Participation is open to power users and above. A meeting may also be used for recognition purposes and sometimes for the implementation of certain technical goals. A current example of a successful, paid meeting with a technical objective is the Python "Sprint"14 Other examples of motivating meetings are KDE Pim meetings which have been held in Osnabrück every January for the last couple of years. GPGoe (plug-in for Outlook Express). The creation of so-called MSI packets is in the foreground of this process. International marketing in government environment in order to create interest for a regular inspection of Gpg4win. Inserting Gpg4Win in conventional software sources for Windows in order to increase numbers of users. The objective is the sustained, independent and self-reliant continued existence of Gpg4win so that updated versions may be published, questions are answered and the web page is kept up to date. The most important part objective is the establishment of a balanced participant structure, shown in Figure 1, pg.6 It is recommended that users are motivated and qualified, and that a process promoting this purpose be created. The second most important part objective is the attainment of commercial stakeholders. It is recommended that preparations are made towards creating a sponsoring concept and being able to accept small payments. The technical tasks (Section 7.2) represent the basis for the measures described above. For cost reasons, in the short term this is only possible with the currently active and hence familiar group. The ideal scenario is the financing by one sponsor, which would secure the implementation of all three items. The main objective here is the simultaneous step-by-step withdrawal from financial sponsorship as soon as the intended structures are able to support themselves and are beginning to grow in a sustained manner. In order to increase the motivation of users, developers and sponsors, we recommend an incentive concept, such as special pins as proof/recognition of helpful assistance (compare Section 7.6). This concept requires a decision-making process for the awarding procedures as well as an individual who will send out the pins. Also helpful are meetings which allow power users and developers to meet in person and directly coordinate further tasks. The qualification process requires the existence of already qualified individuals who support the process. Steps should be taken to ensure that these already qualified individuals are included in the process accordingly. The duration of the qualification process up to the establishment of a balanced participant structure may be between 6 to 24 months. The recommendation is to work towards an commercial stakeholder scenario. One recommended measure is a search for sponsors. This approach for fund raising is at the same time an indicator or a form of vote as to what extent there can/should be a next step towards more enhanced service offerings. Another recommendation for Gpg4win is to set up an opportunity to make monetary donations using the home page, and to find an organisational method for the acceptance and distribution of the funds (see Section 7.5). The next steps should be decided based on feedback for the two measures. Do you like Gpg4win? Then support the project. It is easier than one might think, and even a little amount can accomplish a surprising amount. As with any Free Software you have the option of contributing time or money15. You can provide active support for Gpg4win, regardless of your strengths. Obtain the necessary knowledge and become at first a power user and then a contributor. Participate in forums or mailing lists. Even small suggestions are welcomed by users of Gpg4win or one of the components. Just pick a tasks, tell the mailing list about it and you are on your way. Tell us what you think. What are the good points? Any weaknesses? Is there a problem, and if yes, where can it be found? Is the new version better? Please do this respectfully, since the recipients of the mails often times are also volunteers. Approach other volunteers and financial sponsors for support. For example, you can approach other users. If you know of a business or agency which is already using Gpg4win, it might be in the form of a reminder about doing something for securing the software. Some agencies have already supported development. Let your voice be heard in the political process – praise the results to date and demand a continuation of support. Actively support the distribution of Gpg4win. You can write to newspapers and magazines, requesting that this topic be covered, or advise other software distributors that Gpg4win is not part of their current offering. Talk or write about Gpg4win. Encourage others to use the software. Contribute a small amount using the payment option on the website, accompanied with a short commentary stating any improvements you would be willing to donate for again, and any features you especially like about Gpg4win. Even amounts under 10 Euro can provide a means of support and motivation. For a medium-sized amount, contact one of the project participants and pay against an invoice. You may also be able to commission a specific undertaking, such as updates, fixing of a problem or addition of a function. Please ensure that each commissioned improvement benefits Gpg4win as a whole. As a business or agency you can commission the three measures outlined in Section 8 and thus ensure the sustained continuation of the project. You would then obtain Gpg4win for your organisation on a continuing basis. One of the 'collateral' benefits of this activity is the improvement of security in data transmissions as a whole. 15General	suggestions can often be found in Wiki http://www.deshalbfrei.org/moinmoin/freiheit_helfen.